I can play an instrument, but I can’t read music. 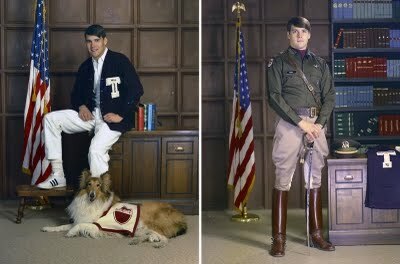 A few more thoughts circulating on the Obama vs. Perry photo at the age of 22. It all ended with a walk-off hit in the bottom of the last inning. California won the championship, 2-1. An American flag draped around his shoulders, Braydon Salzman couldn’t contain his glee when he found California teammate Nick Pratto to give him a postgame hug. 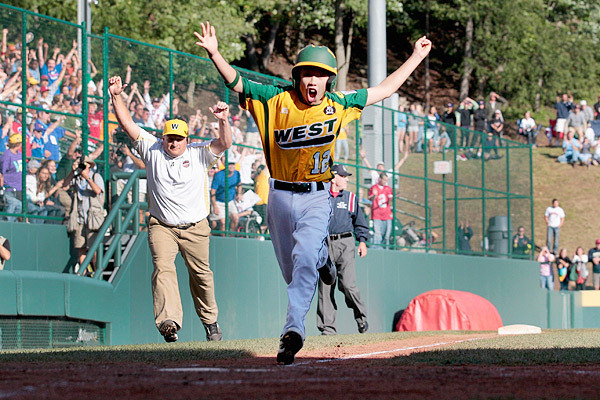 The boys from Huntington Beach are headed home with a Little League World Series championship. Pratto singled in the winning run with two outs and the bases loaded in the bottom of sixth inning, and Salzman pitched a complete-game three-hitter in a 2-1 victory Sunday over Hamamatsu City, Japan, and the tournament title. Despite all the TV hype, looks like Hurricane Irene wasn’t the end of the world, at least in Washington. As Hurricane Irene moved on to flood the streets of New York City Sunday, people in the Washington region were dealing with an aftermath of power outages, flooding and trees that continued to fall in high winds. As of noon Sunday, almost half a million customers were without power in the region, including 117,1780 in Prince George’s County, 111,344 in Anne Arundel, 82,461 in Northern Virginia, 70,341 in Montgomery and 30,223 in the District. Slight damage, but unfortunately 14 storm related deaths. Cleanup will take a while, but isn’t overwhelming. Transportation, though, is a mess. Lots of cancelled flights, including my trip back to DC, but there are alternatives. A couple of bizarre stories last week involving famous men and the women they were stalking. That’s how the State Department is describing a surprising find inside the compound of Libyan leader Moammar Gaddafi: a photo album filled with page after page of pictures of Condoleezza Rice, the former secretary of state who visited Tripoli in 2008. The pictures were first highlighted here on PhotoBlog and went on to be published around the world. Years ago, Steve Jobs of Apple appeared on a PBS special on Silicon Valley. The segment began with the announcement of Windows 95, Microsoft’s new user interface that was supposed to revolutionize personal computing. But Macintosh users knew that the new version of Windows was inferior to the operating system that Mac had four years earlier. Macintosh software was always more user friendly that Microsoft’s. The Macintosh computer was easier to used than anything put out by any other company. Apple put out a far superior product. But the company languished. The creator of this little gem is Rush Limbaugh’s brother, and you can see what’s going on here. 1) The Republicans are going to paint the Texas governor as a war hero, even though he never saw a day of combat. The closest he got to a war zone was flying a cargo plane in the U.S., Europe and the Middle East, when in 1972, the real war was winding down thousands of miles away in Southeast Asia. They’re going to paint Obama as a radical or pimped out black guy, safely in the states. 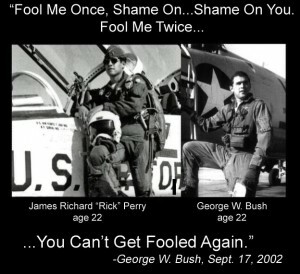 They won’t mention that Perry’s 22 comes near the end of the Vietnam War, while Obama’s 22 takes place during the Reagan administration, which gave us “The Raid-a in Grenada.” And don’t forget that the last time a real war hero got the presidential nomination, it was John Kerry, who the Republicans completely denigrated as a false hero even though he was wounded in combat, in Vietnam. 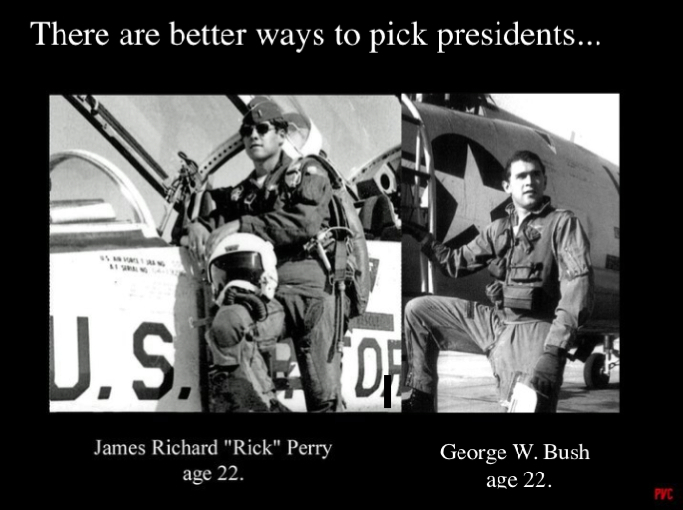 2) Note the prominence of the names: James Richard “Rick” Perry vs. Barack Hussein Obama II. A wholesome American name against a radical African Muslim name. Of course, at 22, Obama was going by “Barry.” Maybe I’m not paying attention, but I don’t see Barry anywhere on the photo. 3) Boy vs. boy. 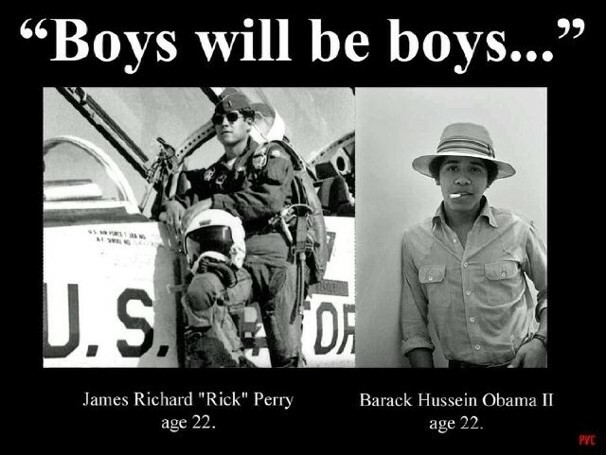 Read into it what you will, but the message here is that Perry isn’t a boy, he’s a man in uniform, while Obama is a “boy” in every racially denigrating way you can interpret. Troy Donahue, meet General Patton. What a dork. So there you have another set of lies from the right. The eras were completely different. The historical context is distorted beyond belief. The racial stereotype triggers have all been set. And the age comparison is nothing more than a lie. 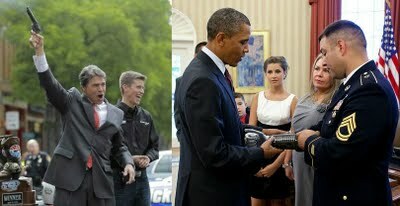 Some idiot with Fox News will say a picture is worth a thousand words. But for this little piece of propaganda, I can think of two. One begins with a B. The other begins with an S.
Remember when this was the biggest scandal in presidential history? But why shouldn't cats govern?